Watch servicing isn’t something new – in this article we won’t be covering new ground as such, merely covering my own journey through the watch servicing world. 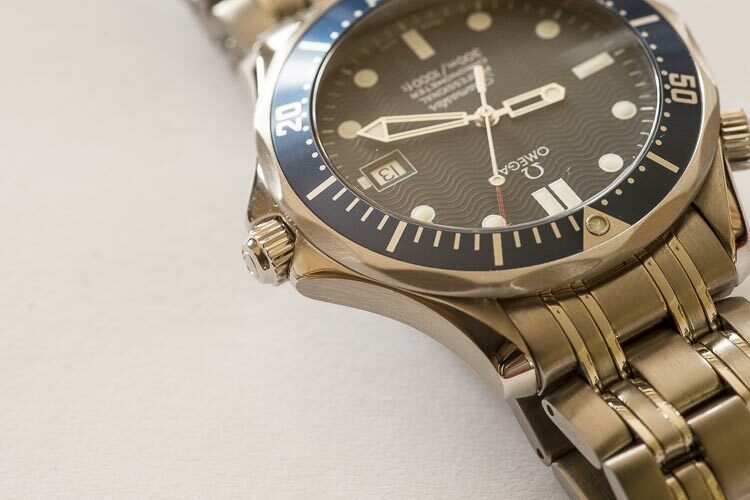 I’ll hopefully clear up a few myths surrounding watch servicing including why it’s important and what to look out for. Like most possessions, the better you look after them the longer they will last – high-end watches are no exception. Typically, servicing is undertaken on automatic or manual wind watches, as opposed to your more mainstream battery/Quartz watches. This is due to the complex winding movements they contain, which must be carefully lubricated and set for them to tell time accurately. 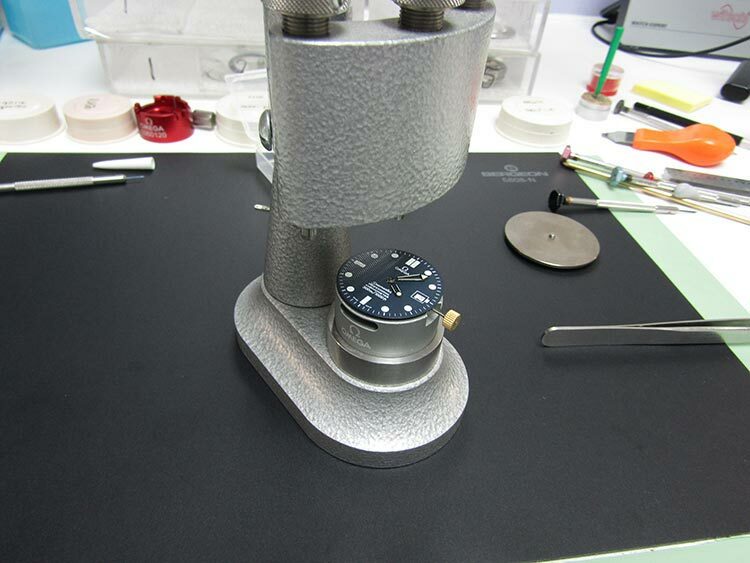 Servicing also freshens up key areas of the watch, such as the seals, to ensure they’re still water tight. It’s no good taking your pride and joy underwater, only to flood it when you discover the seals have perished. 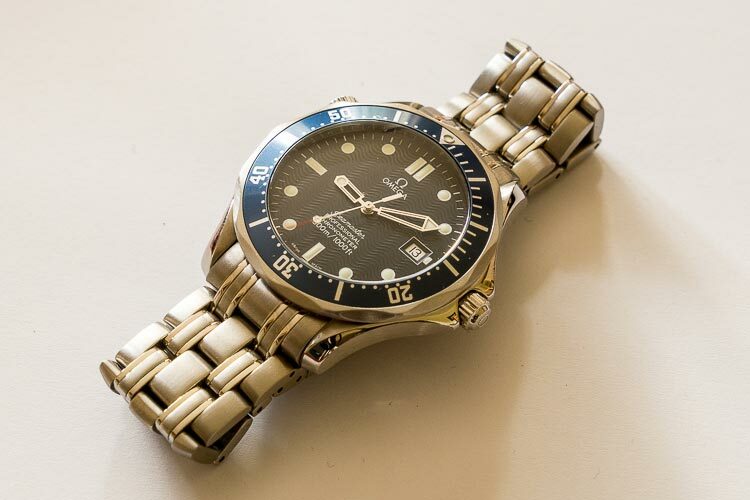 This was exactly my thought when I made a purchase of my own; a 2006 Omega Seamaster. The previous owner was very forthcoming, explaining the watch had never received a service, had been his daily wearer (so had its fair share of scratching) and that the bezel was slightly sticky. Nothing drastically wrong, but it certainly wasn’t ‘mint’. For peace of mind I started searching online for information regarding a service, which proved to be something of a mine-field. Everyone’s opinion seemed to differ as to where, who and how it was best to have your watch serviced, and whether it was necessary in the first place. In the end, I decided I would just plough ahead – I was unsure on the watches history and wanted to be sure before taking it on holiday. One name which appeared numerous times throughout my searching was ‘Swiss Time Services’; an Omega approved service centre based in the UK. After a quick phone call to reassure myself this was the place to go, my Seamaster was booked in and on its way. 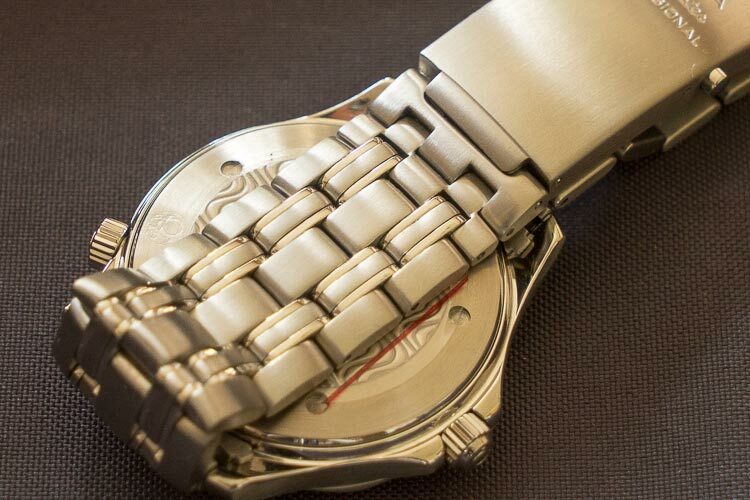 The exterior servicing starts by stripping the watch all the way down to its component parts. This includes the bracelet, which has every pin checked for wear and replaced if necessary (4 in my case were deemed outside tolerance). All new seals will be fitted when rebuilding the watch, so these are removed and set to one side – ready to be returned with the watch. The movement is also placed to one side, with remaining parts then going through a deep clean in an ultrasonic tank. Once clean, re-finishing can begin. With the case, any large areas of damage are filled using a laser welding process; building the metal back up above the surface where it can then be lapped & polished back down flush. 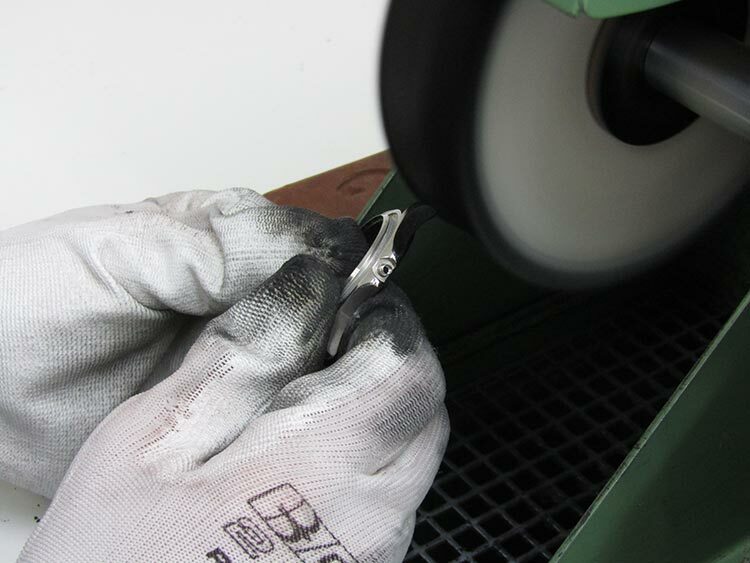 Various polishing and ‘graining’ processes are used, to make sure that the watch’s surfaces look as they did when it left the factory. 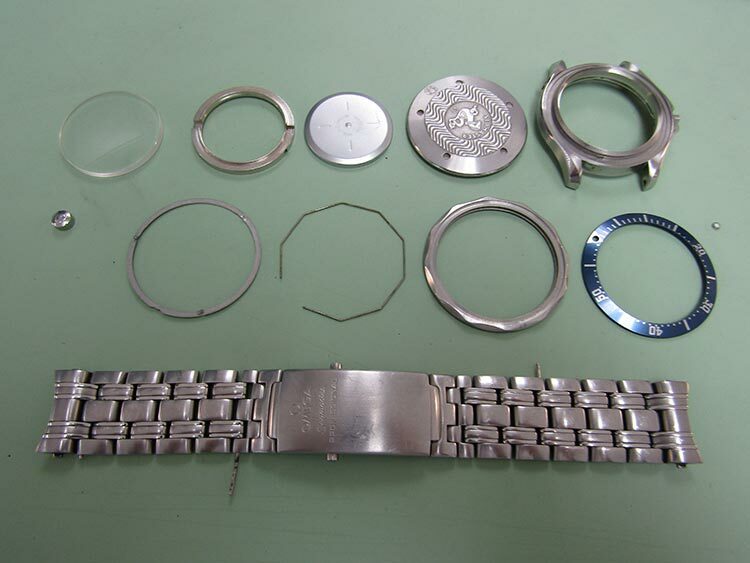 It’s worth noting that some parts of the watch can’t be re-finished, such as the blue bezel insert and glass – so if these are badly damaged they must be replaced. The movement is handled separately to the main case – it contains all the miniscule, fragile gears and mechanisms that make the watch tick. 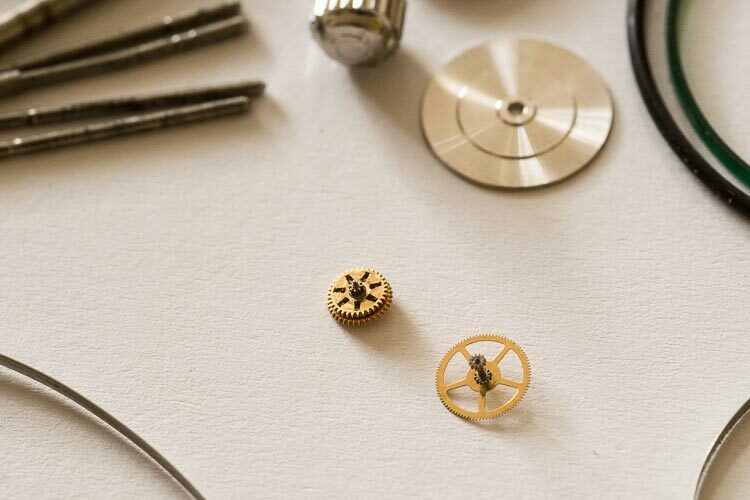 It’s such a shame that these tiny pieces of engineering excellence are hidden away inside the watch; with them laid out you can see why luxury watches demand such a price premium. 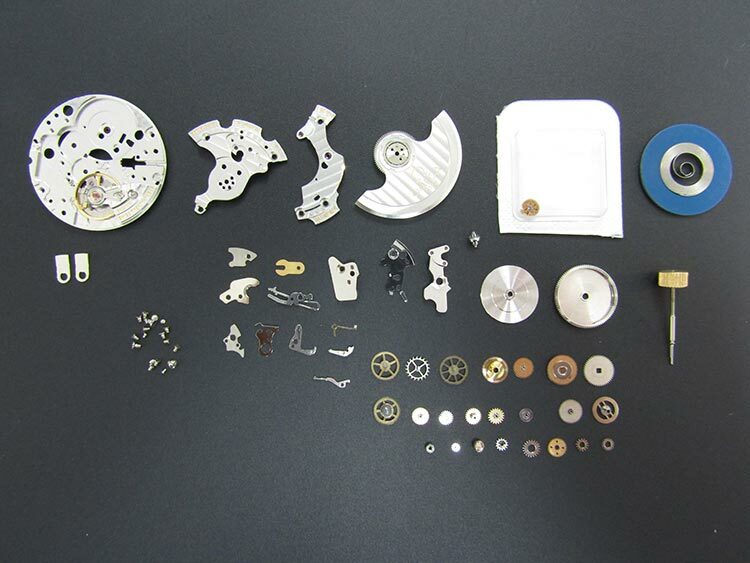 The movement is painstakingly disassembled, then ultrasonically cleaned, rinsed and dried as per the exterior. 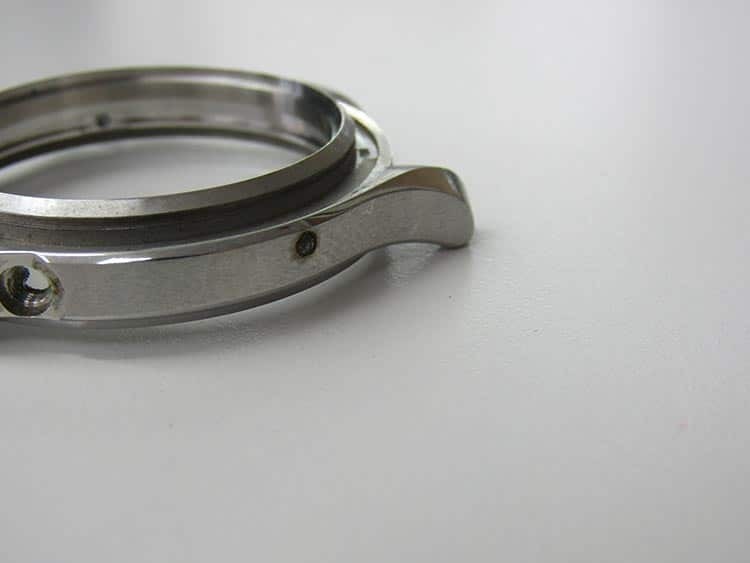 Numerous ‘service’ items are replaced as a matter of course – in the case of my Seamaster the main spring & reverser wheel, to ensure it continues to keep time accurately. Any other items which are seen to be outside specification are also replaced at this stage (in my case, quite a few! ), before it’s placed back together using specialist Omega equipment. 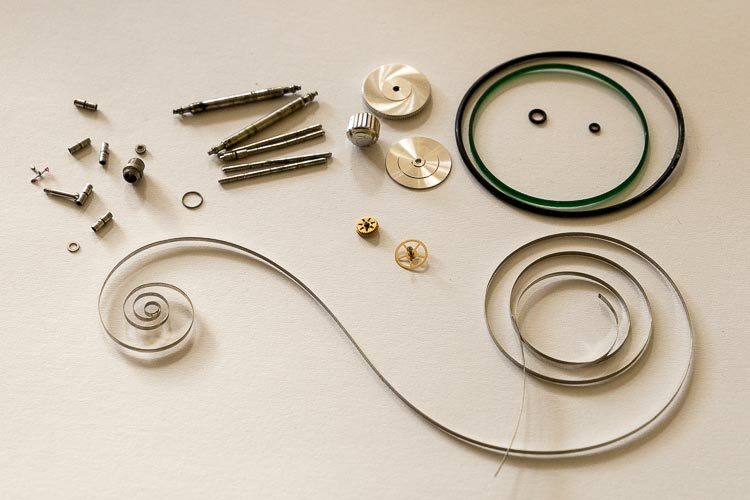 During re-assembly, the movement must be de-magnetised, lubricated and timed, all in accordance to Omega guidelines. 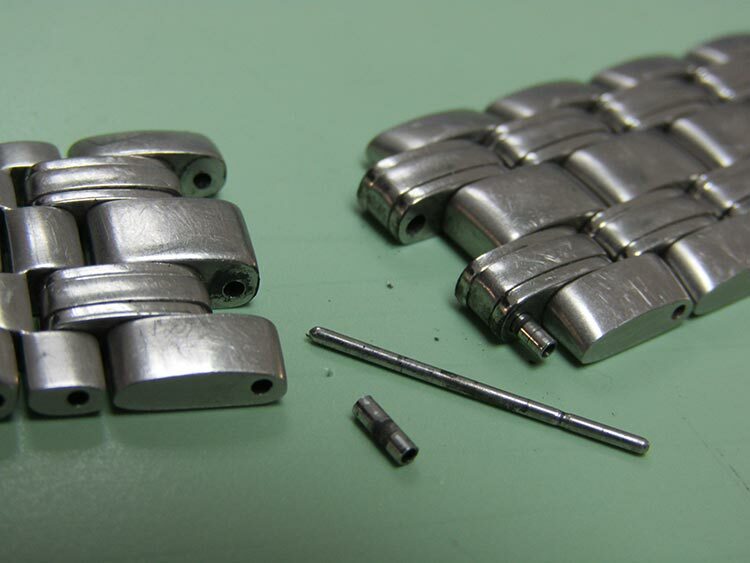 Once the watch’s movement and case have been fully overhauled, the two can be mated back together. 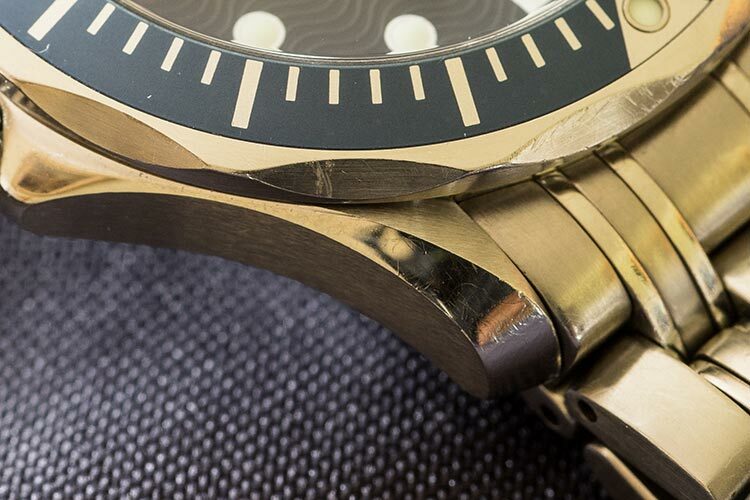 New seals are installed throughout, ensuring the watches underwater ability is tip-top. Multiple pressure tests are then carried out, which verify the performance of the seals under both negative and positive pressure environments. Only once these have been passed is the watch’s underwater ability signed off, with a pressure test report printed for the customer. After pressure testing, a 48-hour inspection period begins. This period checks various functions of the watch, primarily its ability to hold time accurately. 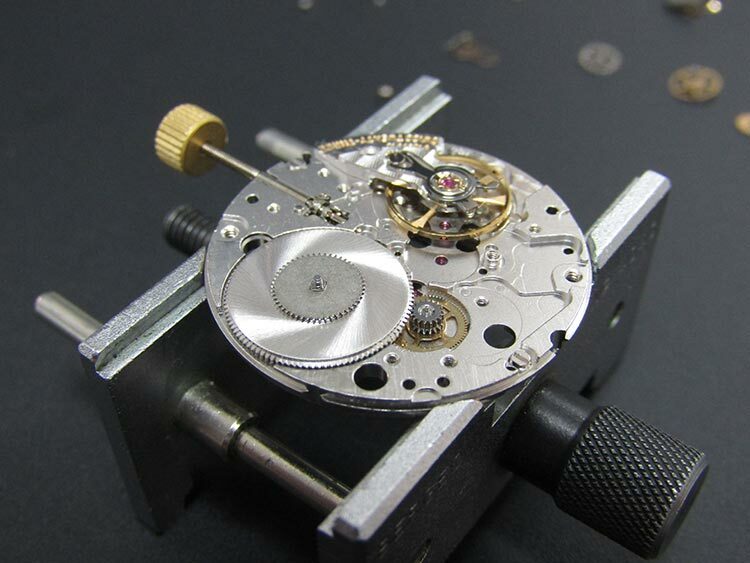 If the watch fails during this inspection period it is returned to the technician and re-worked. Finally, the watch is packed in an official Omega travel case and returned to the customer. Although I’d heard of watch servicing in the past, it wasn’t until I put this article together that I fully appreciated the amount of work that goes into keeping a premium time-piece in top condition. 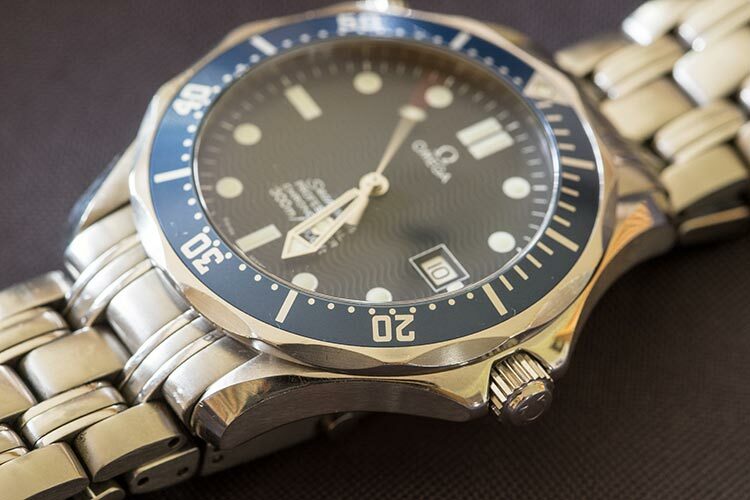 It’s easy to be put off by the price (my Seamaster cost £350 to service, with an additional £32.40 for a replacement crown), but when you consider the amount of work that’s required, it starts to look far less daunting. Then there’s the personal aspect. For me, opening the watch box after the service was like opening it for the first time – a great deal of satisfaction and joy can be had from the new look of your timepiece. For anyone purchasing a watch second hand like me – you’re always left with marks, scratches and grime from the previous owner that never seems to quite go away. After the service, it feels like a clean slate – this is now my watch. Then there’s the peace of mind – the watch is now guaranteed for two years (other agents may differ), ensuring any issues that arise are dealt with properly and not at my expense. It can also be taken underwater worry-free, and should continue to keep time accurately for years to come. Official recommendations for service intervals are 3-4 years, which ensures seals are always 100% and time is kept accurately. How strictly this needs to be adhered to probably depends on where and how the watch is used, along with a little common sense. For anyone looking to have the best possible watch ‘experience’, servicing is an absolute must. I’d like to round this review off by saying a massive thank you to Kieren and Tony from Swiss Time Services; without their detailed information and photos this article wouldn’t have been possible. 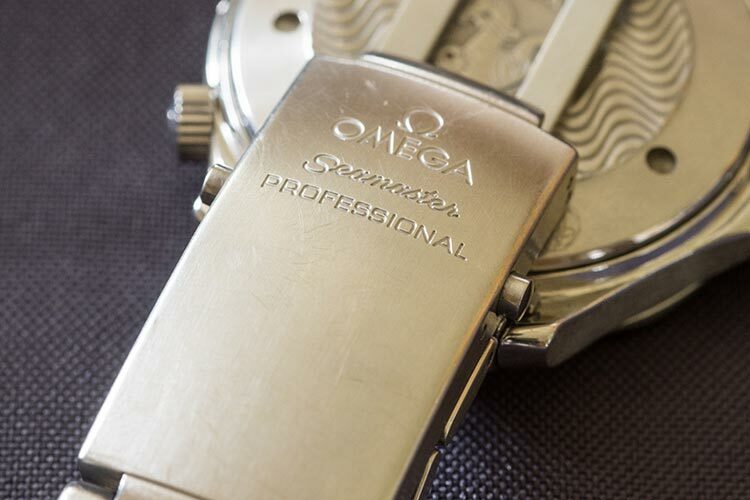 Swiss Time Services carry out all watch work to official Omega working guidelines, ensuring you get the watch back in the best possible state – all in less time and for less money than going direct to Switzerland.